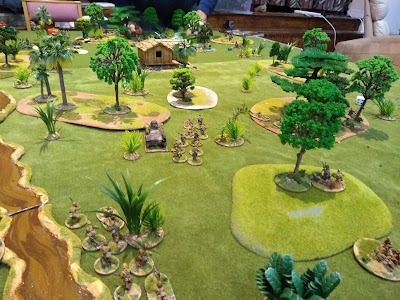 A game of Bolt Action, arranged by Kieron And Matt and the first outing for their Pacific forces. Set in New Guinea, Japanese vs Australians, a simple capture the building scenario. The Australians have a Matilda while the Japanese have a couple of tank shaped vehicles. Things were quite slow moving given the size of the forces, so there is some ongoing discussing as to how to speed the system up. A game of Star Wars Armada, as arranged by Keiron. Two apparently evenly matched forces despite the Imperials having a size advantage. A four-way tussle in this first game of Ghost Archipelago at the club. 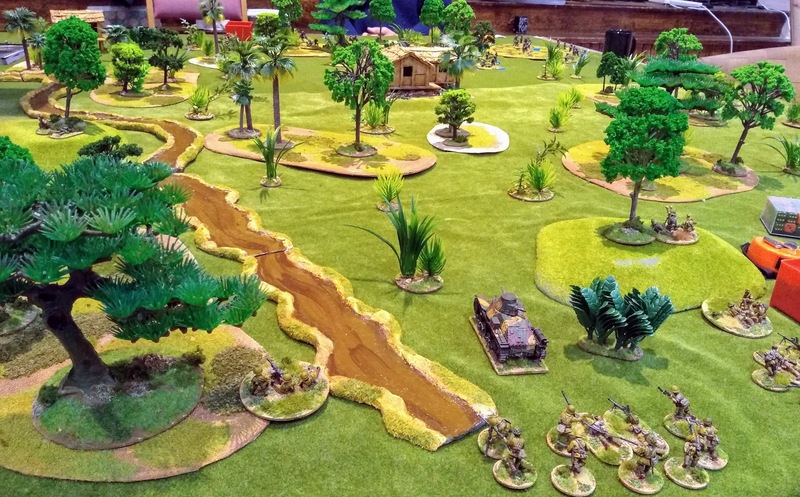 Figures and the majority of the terrain supplied by Matt. A number of boats existed for those who wished to go cruising. Others started deep inland. (Each player started at a separate corner. Certain lanes existed for some long-range magical sniping. Snapping Turtles and betrayals abound as everybody tried to run with the loot to the 'safety' of the beach. An old-style games night which only occurs infrequently nowadays. Jon and Ray coming around for some easter gaming. Running two cars each and dicing off for pole position with second cars at the rear. Montreal track is brutal on the car's tyres and brakes. A bit bland in the corner types which are basically all painful two stop corners, everybody pitted after the first lap of the two-lap race. The track laying by committee game where longest routes win and direct lines are bad. Two games played with much confusion in the second, as sides were swapped but people initially kept playing as their original colour. The traditional way to end a games night. Connect4 meets Poker. Three player version seems to take slightly longer than the two player\team version but not by much. Four quick games. To celebrate 100 years of the RAF, founded on April Fools Day 1918, I organised a couple of games of Wings of War. 4 a side, with one plane each. Getting the players to choose their own planes was probably a bad idea as ended up with a mixed bag of performance types and many planes the RAF would never have flown!. A game of 6mm Great War Spearhead as Dave M displays his new 6mm forces after selling off his 20mm plastics. An early war encounter in Belgium as both French and German forces converged on a railway embankment. The post-apocalyptic 'Even Death May Die' rules make another outing. Three human factions clash while the zombies take advantage for a quick snack. Game organised by Dave M. Tel plays the defenders of the town while Matt tries to recover some stolen loot taken by Mark. Back to Maratha India in the Napoleonic era, but using 'The Men Who Would Be Kings' rules. A little early for the ruleset but still within the playable range. 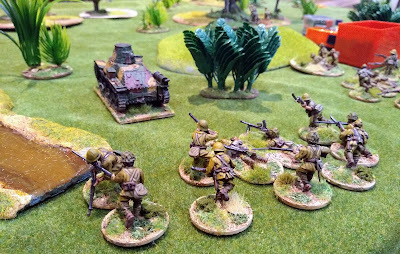 The club has already used these rules in a series of games organised by Dave M, but set in the Great War at the other end of the gameable range. Another trial of Matt's Steampunk Naval game at the club, based on the in-house DTS system. Once more it's the Americans vs the Japanese, using Dystopian Wars models. Three small squadrons on each side, starting a couple of moves outside maximum artillery range. Time for Keiron to crack out the Charlie Company rules as once more his Aussies make their way through Vietnam. Squads distributed amongst seven players. With Bruce (Martin) commanding, Bruce (Matt) in charge of an SAS detachment, Bruce (Simon A) as the Radio\Artillery section, and four Bruces (Tel, Tony, Ben and Alan L) in charge of squads. A simple scenario - patrol through the jungle and inspect the village for enemy activity.